There must have been a unique cardboard box for TT's only???? From all of the cardboard window boxes that I have seen, the way the window compartment is formed, it does not seem there would be enough room for the entire cab and trailer to fit. We need to find one of these!! I acquired this trailer in 2005 in a collection purchased from a former VP/owner of Gayla industries. This was likely to be the TT-2. Trailer attaches with a stubby metal looking pin. 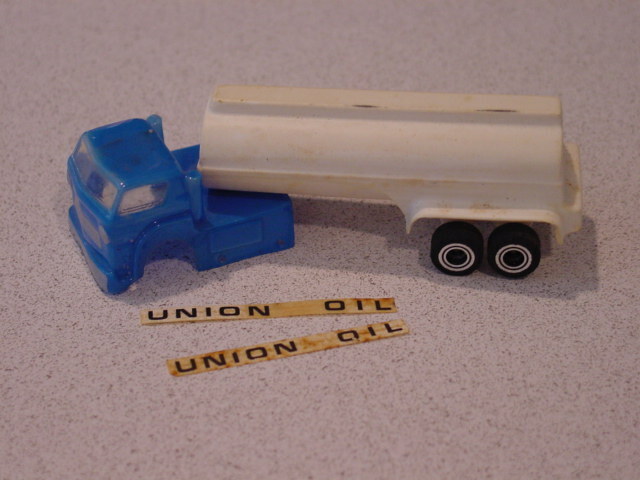 Note the font on the sticker that says Union Oil. This seems to be the same font used on all the trailer stickers (as well as the cardboard boxes as seen above). 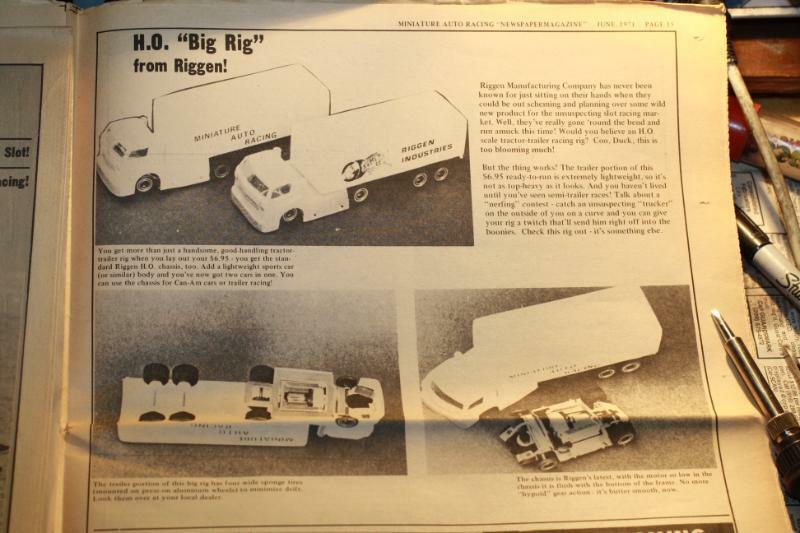 I have in my collection a trailer that has a sticker in the same font as these that says "Tri-Craft Hobby"...also, see the ad below. 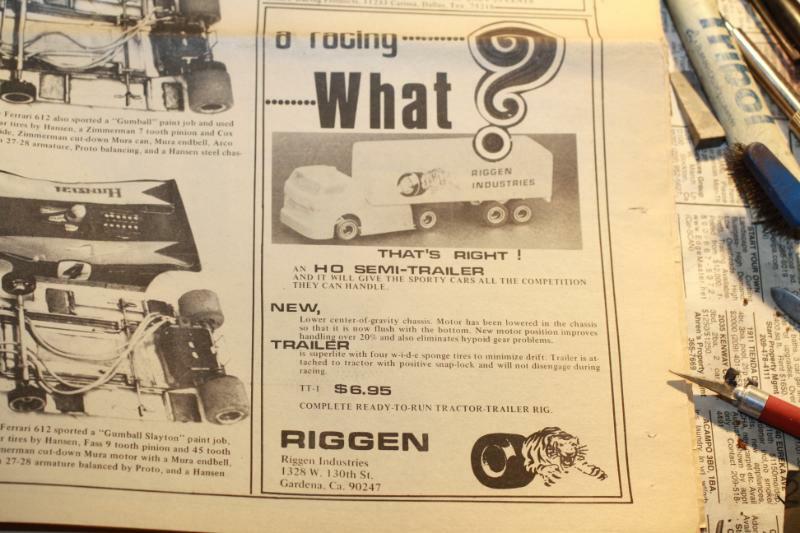 They have a trailer in the picture that says Miniature Auto Racing--appears to be the same font as well. Maybe these could be printed on demand? All of the NOS TT-1 that I have in my collection (5) are on the flush motor mount style chassis. All of the trailers attach via a plastic formed (in the mold of the cab body) male "coupler" that pops into a small hole punched in the bottom of the trailer. The plastic trailer is a two piece affair, The bottom base is molded to accomodate the wheels and has the "structural" help you can see. The box body of the trailer kind of pressure fits on top of the base. You can get a sense of how this works from the brown trailer above. I have the trailers in Blue, Gold, Brown. I have also seen in yellow.